Elections are as much about who shows up as it is who is on the ballot. This is especially true given the relatively low turnout in the recent primary election on August 7th, 2018. The data is still incomplete, but here is an exclusive first look at who turned out by county and age group. 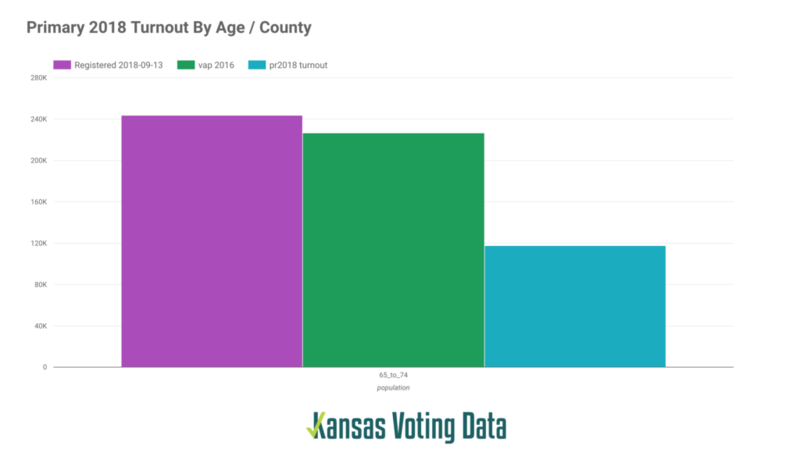 There are approximately 2.2 million Kansans of voting age according to United States Census Bureau’s 2016 5 year American Community Survey dataset. At the time of the August 7th primary election there were 1.8M registered voters in Kansas. The official numbers from the Kansas Secretary of State are 1,801,023. For the purposes of this analysis we will use the registered voter count as of the 9/13/2018 voter file of 1,810,663 so we can have better insight into who specifically voted and their age / location demographics. 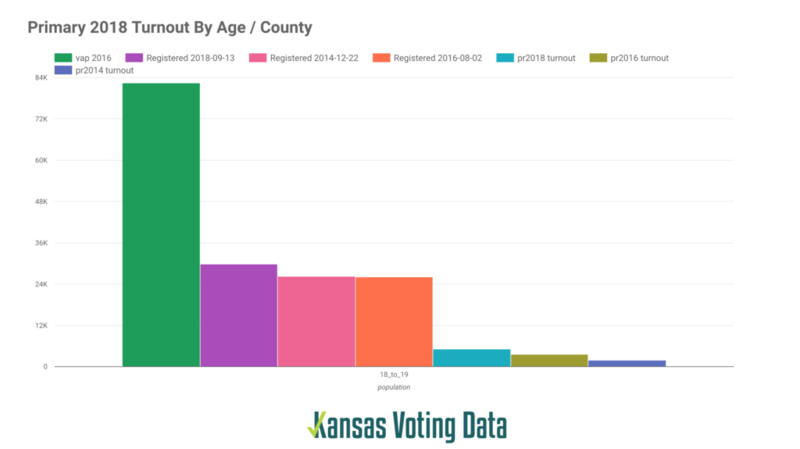 In all, 484,625 Kansans to date are tagged as having voted in the 2018 primary election in the 9/13/2018 voter file. We expect this number to grow a bit as the remaining 13 counties finalize their data input. Interestingly enough, this is already about 11,000 more than is listed in the official election results for the Governor’s race. This is most likely due to the fact that some voters do not vote in every contest on the ballot and some provisional votes do not end up being counted in the final tallies. Stay tuned for further analysis on this issue. We counted all voters listed in the 9/13/2018 voter file by their age cohort and county. We compared turnout data (those listed as having voted in the primary) vs the raw count of registered voters in that same age / county group. We also went back and compared primary turnout data from 2016 and 2014 using voter files dated 08/02/2016 and 12/22/2014, respectively. Given the transient nature of voters and the lack of standardization in local election office data reporting processes, the data set used for this analysis is synthesized from an amalgam of voter files. It is forensically constructed from multiple data sets rather than authoritatively sourced, given that the SOS office does not compute or release authoritative data around turn out. In particular, the 2014 data is likely underreporting slightly, because the source data used is from 6 months after the Primary 2014 election occurred. If looking for authoritative data, overall turnout information is available via the SOS office, but doesn’t allow for disaggregation. The results are embedded below as an interactive chart. You may choose a specific age group or county for a more detailed look or view a larger version here. Only ~ 22.3% of all Kansans of Voting Age Population (VAP) voted in this primary, which also represents only 26.8% of registered voters. For 18 and 19 year olds those numbers are 6.1% of VAP and 10.6% of registered voters. These youngest citizens eligible to vote had the lowest turnout of any age group. Participation numbers steadily climb for each successively older age cohort until they peak at age 65 to 74 with approximately 51% of that group having participated. It is worth pointing out that this analysis actually shows more registered voters age 65 to 74 than the estimated census population. This is because American Community Survey data are statistical predictions aggregated over 5 years time and thus are more approximations than empirical counts. This also means however that the age group of 65-74 is effectively 100% registered to vote. Voter registration among 18 and 19 year olds was relatively flat in 2014 and 2016 but has grown by over 3,000 new voters in 2018. Turnout (the last 3 bars) has steadily increased in each subsequent primary election, although its probable that 2014 is very similar to 2016 turnout given the age of the 2014 data as discussed above. Nonetheless, 2018 marks a noticeable improvement over 2016 numbers. The most obvious initial conclusion is that investments need to be made to improve primary voting engagement for the youngest eligible voters. Primary elections are arguably some of the most important at shaping our political landscape and policy environment, and clearly that message isn’t making it to the youngest generations. What else stands out for you? What additional observations or investigations would you like to see? Let us know!